➤ Featuring 4 cards slots + 1 cash slot. Carrying around your Credit, ID, debit cards and cash without having to take your wallet with you. ➤ Convenient stand function lets you watch movie or browse the web without having to hold your phone. ➤ Sold and Quality Guaranteed by Registered US Trademark Spaysi® Only. ➤ Keep leather dry and ventilated. ➤ Let water spills dry naturally. ➤ Avoid high temperature, rain, great pressure, scrape, mildew, acid, alkali and moist. ➤ Clean the case with a soft cotton cloth and rub gently when get dirty. ➤ Clean leather care regularly. 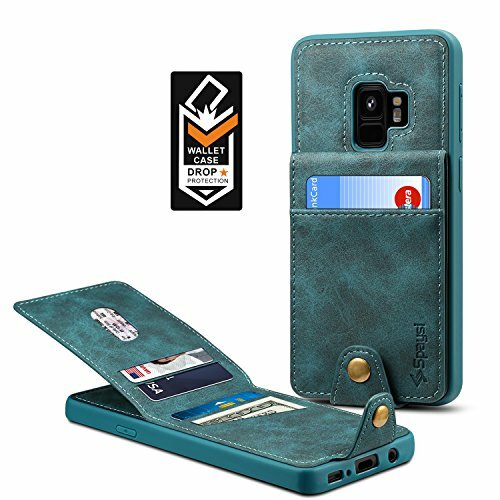 Please Note: This wallet case is only for Galaxy S9, not for Galaxy S9 Plus. Please check your phone model. We also have other models available, so if you ever change phones, you can still stay in our SPAYSI® case family. Protection for life, so you can enjoy the moments that matter. Spaysi Quality Leather➤ Made from durable synthetic leather provide anti scratch + soft feeling. Cover inner lining protect your phone from inside scratch. Practical Card Holder➤ Spaysi case combine 4 card slots + 1 Cash slot for easy access to your ID and credit cards. Magnetic Snap Closure➤ Securely magnetic snap closure make sure your cards holder stays shut, and it will not affect wireless function of your phone.